Chetham’s Library holds a great deal of material relating to Peterloo and the divisive politics of the era. In the main, the collection comprises newspaper cuttings, leaflets (or ‘handbills’) and other printed ephemera, expressing the views of both reformers and their anti-radical opponents. One of the most intriguing items, because it is so different from the rest, is this small book. 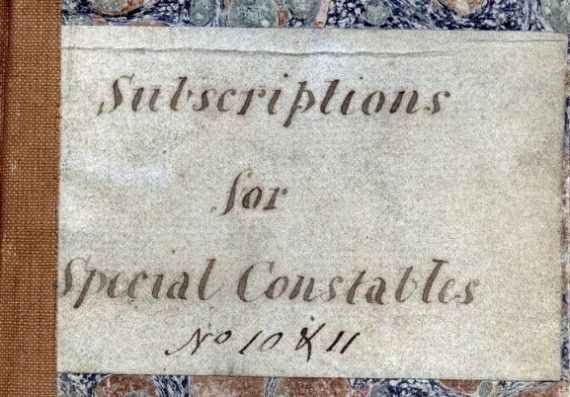 Only 17 cm in height, it contains the handwritten memorandum of a meeting held on 27 August 1819, just a few weeks after the terrible events of Peterloo. 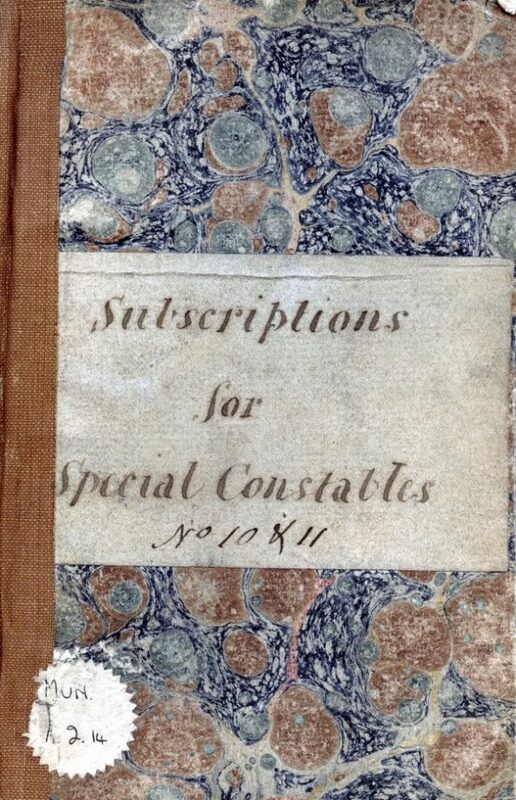 The meeting is called ‘Committee in aid of the Civil Power’, and their aim is to solicit donations for Special Constables who ‘have suffered or who may suffer in the discharge of their official duty during the disturbed state of these towns’. 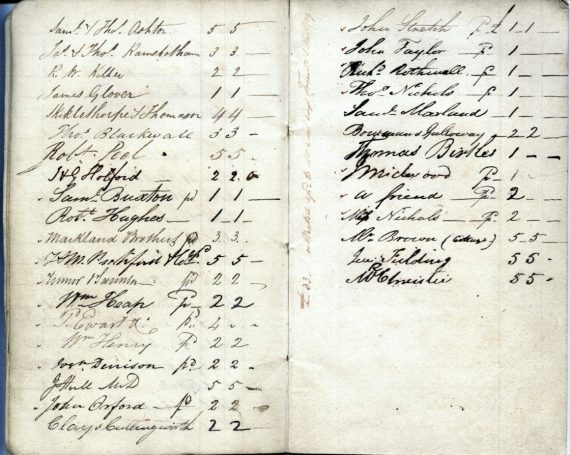 After a series of agreements on how to administer the ‘relief subscriptions’, there follows a list of 114 donations made or pledged by individuals and local businesses, such as Hutchinson Mallalieu & Co, ironmongers and merchants trading in Cateaton Street (opposite Manchester Cathedral). Among the other recognisable names is Revd C. Wray, a popular (if eccentric) member of Manchester Cathedral’s clergy. Red ticks and the letters ‘pd’ indicate those who have paid up front. The subscriptions total £396 – a significant sum at the time, enough to have employed seven skilled tradesmen for a year. 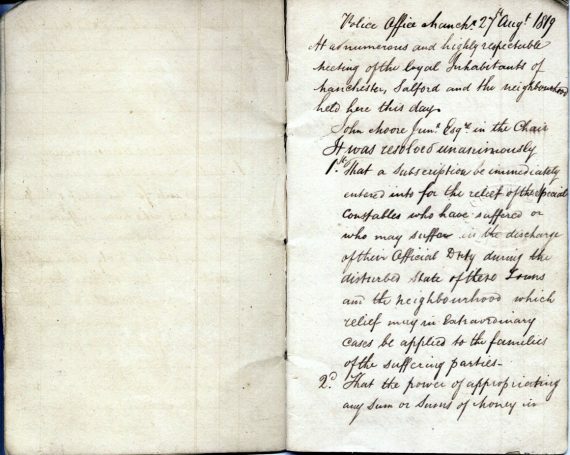 A full, digital facsimile of the notebook is freely available via our online catalogue – follow this link – and, for the bicentenary of Peterloo this year, we have drafted a new transcription of the manuscript (click here) in order to make it more accessible to readers and researchers. If you recognise names in the list, or can help us to correct parts of the transcription, please do share your insights: either in the comments section below or by emailing grace.timperley@chethams.org.uk.